Caladiums, or Angel Wings, are truly a unique looking plant. They have large, arrowhead-shaped leaves that come in striking combinations of green, red, pink, and white. 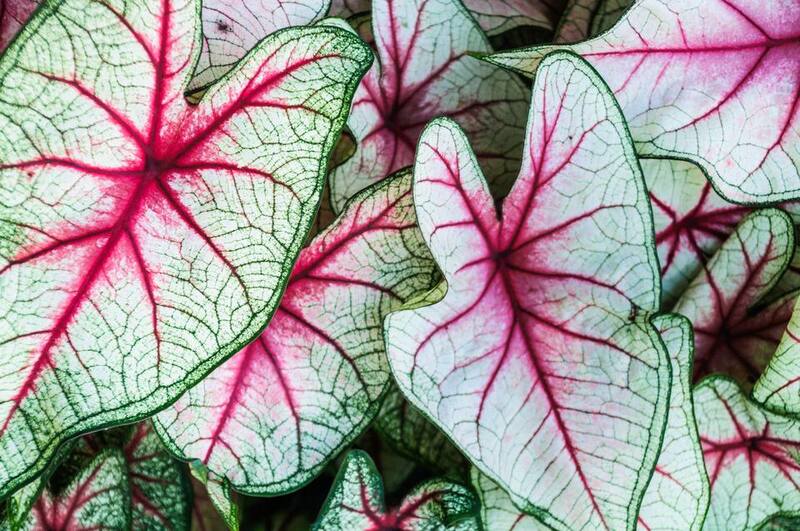 Caladiums are fantastic houseplants, but they are equally delightful outdoors. Grow your Caladiums in partial shade, where they are an unexpected and welcome burst of season-long color. They are only hardy to about USDA Zone 9. In cooler climates, you can grow them as annual plants and bring them indoors for the winter. There's no missing the tropical flair of canna plants. They have huge banana-like leaves that can be green, red, striped, or something in between, and flowers in glowing shades of red, yellow, and orange. However, even without the flashy blooms, these plants would be standouts and some gardeners even remove the flower stalks so that the plant can focus on growing leaves. Canna plants love water and heat. If you think keeping them watered might become tedious, consider planting them in containers and putting them in a water garden. Now you're talking tropical paradise. Although Artemisia is in the daisy family, the flowers tend to be insignificant. Ah, but the leaves can be as airy and charming as you could wish. Some of the most popular garden Artemisias include mugwort, southernwood, Sweet Annie, tarragon, and the wormwood, shown here. Most Artemisias have silvery-gray foliage that beautifully offsets both pastel flowers and richer tones like deep mauve, purples, oranges, and blues. They pick up the slightest glint of sunlight in partial shade and light up surrounding plants. If they get a bit untidy in summer, simple shear the old foliage and new silvery leaves will appear. Shade growing coleus plants were a popular Victorian bedding plant, but it wasn't until they developed a sun-loving coleus that they really captured the hearts of gardeners. Now you rarely see a garden without at least one coleus plant. They are also popular in containers and even indoors as houseplants. Sun coleus come in a rainbow of colors–sometimes all on one plant. Bright cheerful plants with names like "Big Enchilada," "Brilliancy," and "Copper Sun" hint at what to expect on the coleus aisle. Pinching makes the plants bushier and fuller, with more glorious colorful leaves to enjoy. The original Coral Bells were a charming plant with ruffled green leaves and airy pink bell-shaped flowers that made them favorite plants of hummingbirds. 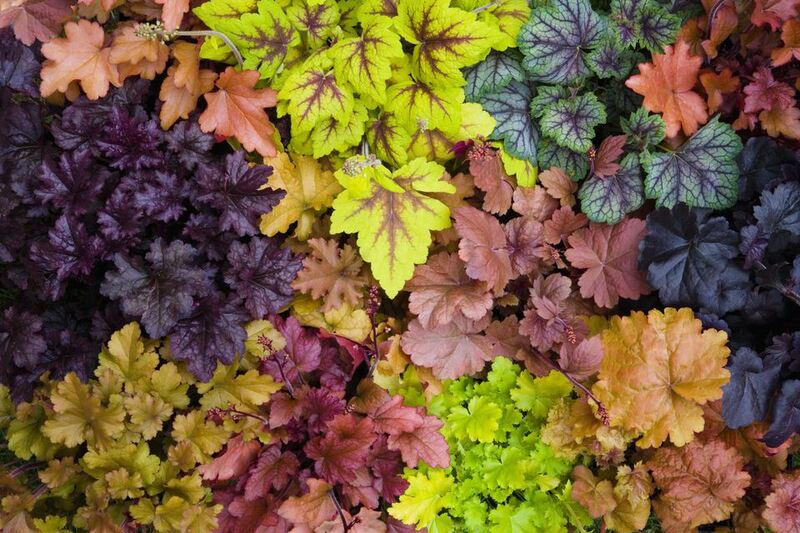 But much the way plant breeders went wild developing new Hosta varieties, they have embraced Heucheras and figured out how to give them purple, bronze and patterned leaves. Most Heuchera plants do best in partial shade, but they will also grow well in the sun if they have sufficient moisture. They form tidy clumps and are perfect for edging borders, planting under taller plants and are great for containers. Hostas come in shades of green, gold, and blue, as well as a variety of variegated leaves. They prefer partial shade, where the brighter whites and gold reflect the subtle light and enliven the plants around them. Although known as shade plants, there are several Hosta varieties that can be grown in full sun, expanding their value in the garden. There are only a handful of Hosta varieties, like Hosta plantaginea, that have really attractive flowers. Most of the time the flower stalks are cut off before bloom, allowing the plant to focus on growing their delightful leaves. Ornamental grasses add texture, movement, and sound to your garden There are dozens to choose from. Some shine with their flowers or inflorescence, but many, such as blood grass, porcupine grass, and zebra grass, need only their leaf stalks to standout. You will need to consider height, growth habit, and even season when choosing your ornamental grass, to get one that is suitable for your garden. The leaves of Strobilanthes, or Persian Shield, are almost iridescent. This is a sub-shrub that remains evergreen in hot climates. It is grown as an annual plant in cooler zones, or as a houseplant. If you keep yours as a houseplant in winter, you can easily take cuttings in spring, to plant out in the garden. It's a great money saver. Persian shield can handle full sun, but the iridescence makes them almost glow in partial shade. As with so many fantastic foliage plants, Rex begonias are tropical plants. That doesn't stop us from growing them both as houseplants and in the garden. The foliage of Rex begonias can be swirled, spotted, or spiraled, thick, ruffled, or winged. They are such intriguing plants, many people collect them. Unfortunately, Rex begonias can be a little fussy to care for, unless you live in the tropics. It's often easier to grow them in containers, where you have more control over the soil and growing conditions, rather than in the ground. New Zealand Flax is a wonderful dramatic accent in the garden. Some varieties can grow well over 7 ft. tall and others are small enough to be suitable for growing in containers. There is also a wide selection of colors to choose from, in shades of green, yellow, white, pink, and red. In warmer climates, Phormiums are evergreen perennials. They are predominately grown for their blade-shaped leaves, but the plants also send up a flower stalk with attractive blooms in red or yellow. The rich colors and deeply lobed leaves of sweet potato vines make them popular choices for both container plants and groundcovers. They are related to the sweet potato we eat, but the tuber is not as tasty. These vines are grown specifically for their ornamental foliage, which comes in a wide variety. "Margarita" has bright chartreuse leaves, "Sweet Caroline" or "Sweetheart" has burgundy heart-shaped leaves, and "Tricolor" has green and white variegated leaves that are outlined in pink. Plectranthus is a free-growing, bushy plant that loves damp soil. The leaves are thick and slightly fuzzy, with a ruffled edge that can be variegated white. Most plectranthus are grown strictly for their foliage, which is similar to their cousin Swedish ivy. Pinching them back periodically will keep them full and lush. A newer variety ‘Mona Lavender’ plectranthus, has tall lavender flower stalks that make it a popular container and indoor plant. Many ferns, with their lacy fronds and airy growing habits, are lovely, however, Japanese Painted Fern stands out in the crowd. Plant them in a partially shaded nook and their silvery leaves will catch every ray of sun that stumbles into the garden. "Pictum" has reddish-purple stems that make the silvery-green fronds shine even more. "Burgundy Lace" takes it a step further with pink tinted fronds. These are not large ferns, growing about 12 inches tall, but they are eye-catchers. The soft, fuzzy, gray leaves of lamb's ear plants are known to delight young children who get the chance to rub them, but they are also delightful to gardeners looking for a velvety texture to soften the hard edges of a walkway or for a downy gray color to act as a foil for nearby pastels. Newer cultivars, such as "Helen von Stein" have been bred vegetatively and they do not bloom, so no deadheading is required to keep them looking great. The foliage of Amaranthus plants can be so audacious you will wonder why they even bother blooming. Amaranthus tricolor is a sunburst of yellows and orange. If you think the common tricolor is bold, you should take a look at some of the cultivars, such as "Perfecta." These plants will light up your garden on the cloudiest days and for weeks on end. Amaranthus tricolor is an annual plant and very easy to start from seed. Dusty Miller is often grown as an annual plant and used as filler in the garden or in containers. That really doesn't do it justice. This soft, powdery gray foliage plant is extremely drought tolerant and forgiving of many tough growing conditions. Its subdued color is an excellent foil for bolder colors, such as hot pink petunias and buttery yellow coreopsis. Look for some of the named varieties, like "Silverado" that stay fresh looking longer than the species plant. The imposing size of Elephant Ears adds instant drama to your garden. They have a definite tropical flair and enjoy being grown partially submerged in water. Although they are only hardy to zones 8 and above, Elephant Ears grow quickly from large tubers, which can be stored for the winter, to grow again next season. Lungwort actually has stunning flowers in early spring, however, they don't last very long. Luckily the leaves are splattered or completely washed with silver or white and remain a welcome sight for the remainder of the growing season. These are short plants that are a bit slow to spread, but they eventually make lovely carpets with glowing flashes of iridescence.